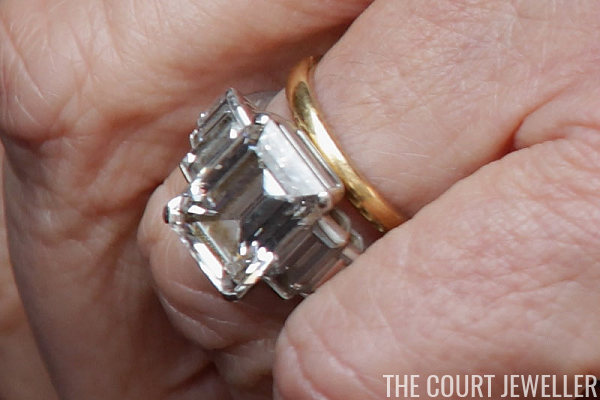 Our Sunday series on royal rings continues today with a look at a truly classic rock: the ring that the Prince of Wales gave to the Duchess of Cornwall on their engagement. 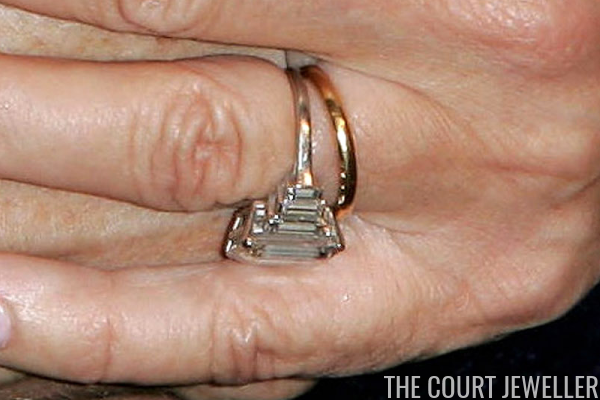 Prince Charles proposed to Camilla in 2005 using a family heirloom: a diamond ring that had belonged to his beloved grandmother, the Queen Mum. The diamond and platinum ring is made in the Art Deco style, with a large central diamond flanked on either side by three diamond baguettes. 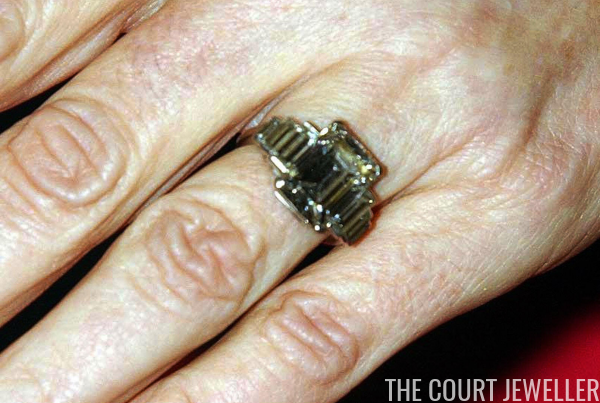 The ring was not the Queen Mother's own engagement ring. Its exact provenance remains unclear, but some have said that it was a gift to her from George VI to mark the birth of their elder daughter, Queen Elizabeth II, in 1926. 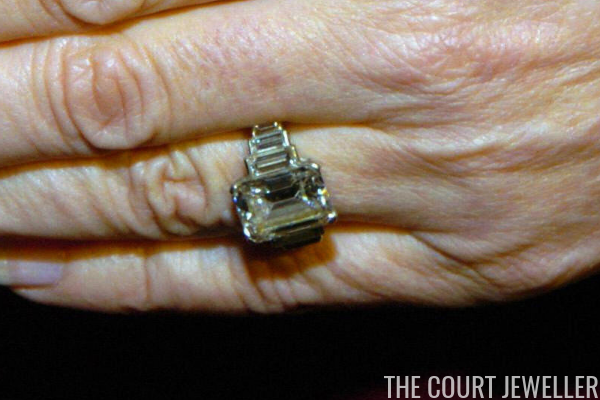 The Queen would have inherited the ring from her mother in 2002, along with the rest of her jewelry, as a way to circumvent a crippling tax bill. However, it seems that certain pieces of jewelry were earmarked to be given to Prince Charles -- pieces that are worn today by the Duchess of Cornwall. Camilla made her public debut in the ring on February 10, 2005, just after the news of their engagement was broken. She's been wearing the piece regularly ever since, even though its size means that it often slides around her finger. Here's a side view of the ring, where you get a decent idea of the size of the stone and the band. 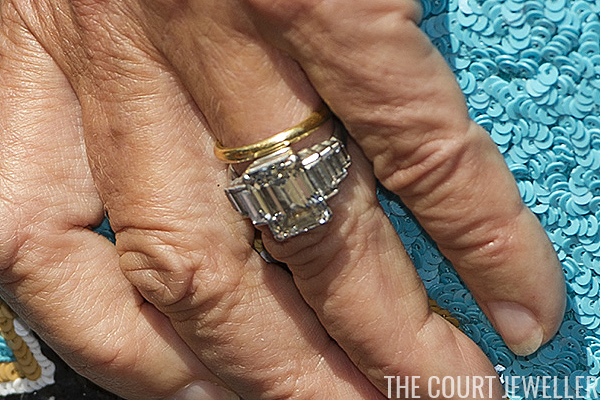 Today, Camilla pairs it with her Welsh gold wedding ring.